1. Preheat oven to 350 degrees. Coat a 9” spring form pan with cooking spray. 2. To make crust: In a medium bowl, mix together graham cracker crumbs and melted butter. Press crumbs into bottom of the pan. Set aside. 3. To make filling: With an electric mixer, whip cream cheeses until smooth. Add cranberry sauce and mix until well combined. Spread over crust. 4. 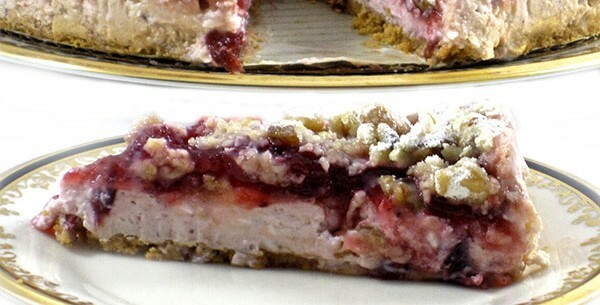 To make topping: In a small bowl mix together cranberry sauce, brown sugar, cornstarch and vanilla. Spread evenly over the top of the filling. 5. Bake for 35 minutes. Meanwhile, prepare the final topping. 6. To make final topping: In a small bowl, combine the flour, walnuts and butter until crumbly. Remove the cheesecake from the oven. Sprinkle topping over the baked torte. Bake for 10 minutes more. Remove from oven. 7. Cool completely and refrigerate. Chill at least 6 hours or overnight before serving.